Because they're both short, when they walk after it rains outside, even though we avoid the puddles, it's inevitable that their bellies and legs will get disgustingly soaked and dirty. After I shower them, they also attempt to fling water everywhere and run off in hyper mode. I don't know why they do this but this is especially true of my JR. She runs around like crazy after her bath so I have to hold her tight in order to try to dry her part way before she tracks all that water everywhere. Do your pets get hyper after their bath? The Pom, however, has a double coat, so his fur soaks up so much water that I end up having to use 3-4 large bath towels just to dry the both of them partially. It's hectic and I always wished I had something to dry them off better because I worry that they'll catch a cold! You can imagine my excitement when I found out about Soggy Doggy products. Each of the “noodles” in the Soggy Doggy Doormat® and Soggy Doggy Super Shammy is made from millions of textured, ultrafine strands woven together...creating a massive surface area that allows for great absorbance and super-fast drying! The doormats are said to be able to absorb 5x more water than regular cotton doormats and the Super Shammy should be able to hold up to 7x its weight in water. The material, however, is nice and soft, and can even go in the washer and dryer. Make sure you do NOT use fabric softeners on these though. same as before the shower! The babies were so nosy! As soon as I took the wrap off, they came running. I couldn't get a pic of our JR because she kept moving so it came out blurry. Baby Pom, however, would run and jump onto the mat and just lay there! I laid the Doormat down as a bath mat since I was showering both the babies and then used the Shammy to dry them. The Shammy has these nice, hand pockets as to make the drying process easier. The bath mat was such a treat and honestly, didn't even feel damp after putting two soaking wet dogs on it. The Shammy was awesome! I was able to dry both of them off about 95% with just one Shammy. I had never even been able to get them this dry even when I used my 3-4 bath towels plus the bath mat. The hand pockets were semi-helpful but this cloth is just amazing! The JR actually looked dry and Baby Pom didn't look like a wet Gremlin! Two words...LOVE IT! The babies love it too, I keep catching them playing on the mat! The beauty of these items is that they're not just for bath time! They can be for after the rain, on road trips, as crate liners and so much more. They do come in a variety of color choices and the Soggy Doggy Doormat comes in 2 sizes: 26" x 36" and 36" x 60". I was sent the smaller size for review and I feel that its a good sized mat for my two small dogs. If you have larger breed dogs, then you may need to size up. The Super Shammy is one size only and is 31" x 14". Buy It: Shop online for your own Soggy Doggy products. Soggy Doggy Doormats retails for $39.99 (small) or $84.99(large) and the Soggy Doggy Shammy retails for $19.99. Use WHIRLDOG15 for 15% off your purchase! 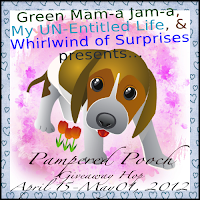 Win It: 1 lucky Whirlwind of Surprises reader will win a Soggy Doggy Doormat($40) and Super Shammy($20) for themselves! Come back to enter the giveaway. Show the sponsors some love now. Like Soggy Doggy on Facebook. Definitely entering your giveaway!! I want one of these!!! This sounds like just what I need. My babies get so wired after a bath or the rain hits them. Something I'd love to try. Thanks for the review and the AWESOME giveaway! This sounds like a very helpful product! Cute! That would be helpful when my dog decides to go out in the rain. Aw! Both your babies are so cute. Oh gosh I have to win these products. My Yorkie does exactly what your does do after a bath. He loves to run a hundred miles an hour through the house and then rubs his face on the carpet until it is dry. I wondered how well these products worked and after your review I would say I'm sold on them. If I don't win them then I guess I will have to buy them. I've got a big drooly pup who loves to play in the mud, rain, snow... you name it. I will def be buying one of these!!! Love how versatile this mat is; for drying, as a doormat for dirty feet, for use in your car, etc. and that they are machine washable for continued usage. I really like that you can machine wash them when they're dirty. Great stuff for "wash and go" dogs like our German Shepherd. He's HUGE, and resembles a super sized sponge when he's wet!